This course was a hands on introduction to physical computing and custom controllers for interactive media. Students developed prototypes using simple and ordinary found materials. We discussed technologies surrounding electronic prototyping and concentrated on the design and development of projects in class. Students learned to design systems that read local information from objects, people, or physical spaces (such as heat, light, sound, vibration, movement). We provided a basic overview of ways of connecting microcontrollers to networks (such as GPS, Ethernet SitePlayer, radio frequency, infrared, and the Internet) to experiment with bridging the gap between real and virtual worlds. The primary focus of this class however, was a radical emphasis on activity and prototyping with simple and ordinary found materials. Think “Scrapyard Challenge” for interaction design. 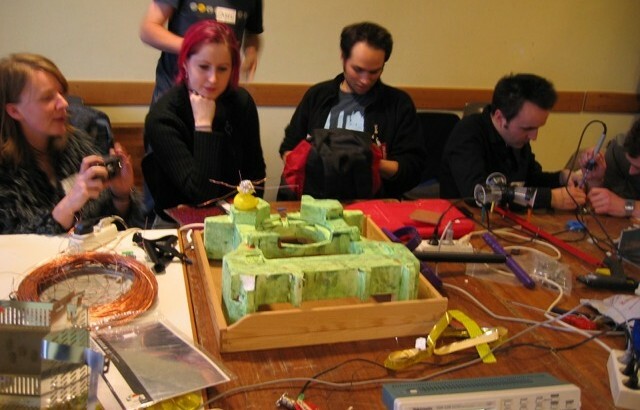 Low-tech and DIY approaches to technology formed the foundation for student’s work. Attendance was crucial, as the majority of work assigned in class was completed during the scheduled instruction time. Some reading and out-of-class exercises were assigned. Students were expected to keep an online record of their progress through the term.